Located in Eustis Florida, Lake County. Close to south Marion County/Ocala and just west of Orlando. Winds of change are blowing in the horse world. What was once acceptable training or common-place horse breaking practice is fast becoming a thing of the past. Once upon a time, and unfortunately sometimes still, horses' spirits were broken and they were forced to serve us. Problems may have been taken care of swiftly but not necessarily in the most humane way and many times not at all or were even made worse! Thankfully, this can be a thing of the past. The last decade has brought a revolution to horse training called Natural Horsemanship (NH); a blessing for horses and horse owners alike. Over recent years more and more people have embraced the idea of NH, revolutionizing equine training and behavior modification and paving the way for horses to become partners instead of slaves. One trainer that has devoted her career to bettering horses' and owners' lives through natural horsemanship is Marcie Morey of Central Florida. An expert in equine psychology and behavior, Marcie is educated, skilled and experienced in the best methods known nationally and internationally for being the most natural and successful with horses. From starting & developing young horses to problem solving and fine tuning, her instincts and communication are exceptional. 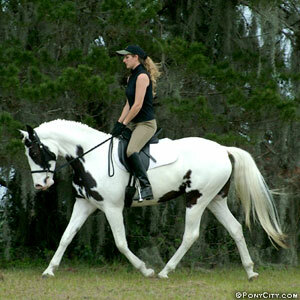 Marcie has been practicing natural horsemanship for many years along with an already successful career with horses. Since childhood, she has shown in several disciplines and racked up many hours on trails. In addition to Marcie's diverse background she is also a gaited expert, developing gaited horses naturally and unraveling common frustrations among gaited horse owners. Her approach, philosophy and teaching ability sets her apart from other trainers and instructors. Please read more about Marcie in her BIOGRAPHY.